Play free robot games online! Choose the robot game you want to play from the list below. You can sort the games alphabetically, by date or by rating. Almost all of our robot games are playable on full screen. Have fun! Shoot down waves of machines and robots using your giant nuke gun! Are you a robot? Survival match arcade, mix Tetris and match-3 genre. The robot factory is getting out of control unless you match three or more robots to turn them out. New robots get invented, the pace accelerates – attention, it’s highly addictive! You are the new employee at Variety and Same Cookie Company! It is your job to ship out cookies with the cookie robot. Remember, cookies boxes must be either all the SAME or all DIFFERENT! Screw up too many times and it's time to hit the unemployment office! Welcome to the RCNT. A lot of puzzles and actions. Use arrow keys to activate your motoric functions. OMG, Becky—look at that bot! Collect as many gems as possible as you race your bot to the end of each level. Maxx The Robot is an action packed shooting game. 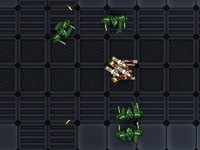 Your objective is to Shoot the enemies and find your exit path to unlock the next level. Save your game at save point in each level. Upgrade your weapons after every level. R.O.B.O.T Relatively Obedient Being Of Thought - Control the last KX-3700 Army-class robot in existence against the never ending onslaught of other robots sent to terminate you. Upgrade yourself in 8 different tracks. Version 5 will get you the tier 2 upgrade and version 9 will get you tier 3. How long can you survive?